Floyd Samuel Sexton came into our lives on September 24, 2012. He was rescued from the south side of Chicago when he was about 4 months old by Recycled Rotts, a local rescue organization. He was at his foster mom’s for about three days before we met him in person and needless to say it was love at first sight when he curled up in a ball at our feet. Floyd is named after Three Floyd’s beer (a personal favorite of his parents also brewed in his mom’s hometown) and his middle name is in honor of our first Recycled Rotts rescue, Sam. Floyd is best described as a Jack Russel Terrier trapped in a Rottie body – energetic is an understatement! On a typical day you can find Floyd walking all over the city in various locations clocking in about 7 – 8 miles a day traveling to and from ANY place that has treats. Floyd is one of the smartest dogs I have known (am I biased, yes). He understands sentences, will get his leash on his own, and can open a door with his mouth. 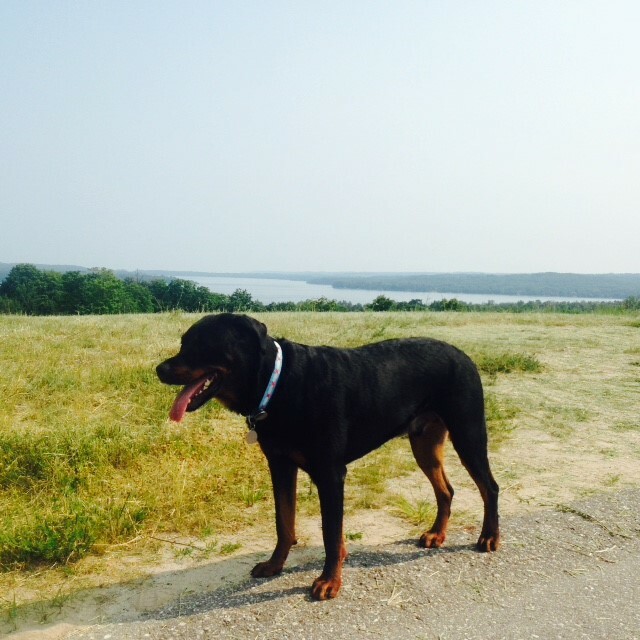 Floyd spends much of his summer up in Leelanau county, MI doing various activities – paddle boarding, swimming (aka wave eating), hiking and digging holes in the sand looking for tennis balls. Floyd loves to say hi to other dogs, but is not a huge fan of the dog park – they bore him after a few minutes as he prefers to be out exploring. About 2 years ago while Floyd was guarding the back door, a small black and white kitten was begging to come inside. Floyd decided she was a pretty cool play buddy and welcomed Fiona with open paws into our home. You can find Floyd and Fiona enjoying random daily chases and naps alongside one another. They say when you meet the right one you just know. Floyd had some big shoes to fill when we lost Sam, but he has been the perfect dog at the perfect time. We could not love him anymore. Floyd would like to thank Brandon, Amanda and Francesca for always taking good care of him on his walks and overnights. He loves you all!